Following on from last week of my review of what is at the moment The Best Film this year, which by all counts is going to be hard to beat, at least to me, but the previous post looked at the human side story of the film, cast and soundtrack, but really this is the big one as I will be looking at the BIG G himself. From special effects to both Godzilla and his new companions to comparisons in story with another monster movie series as well as how this new film compares in not too much detail with the original monster and also why I think it is not just the best film this year, but one of the best film’s in the series, and that comes with evidence. The film’s special effects are really well done, and I mean really well done at that. 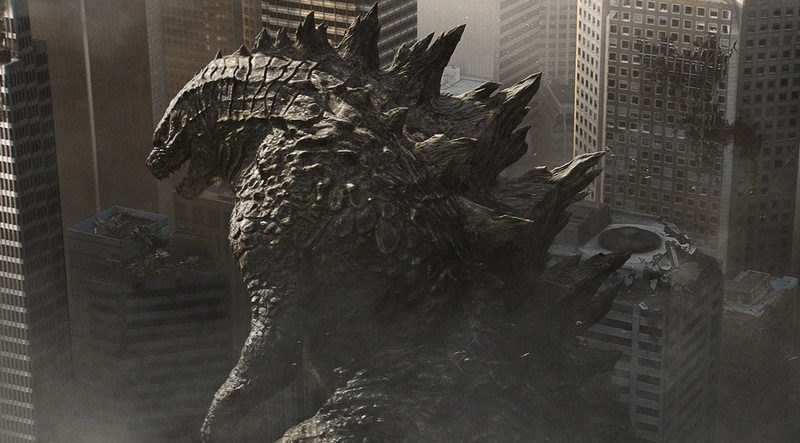 The film’s producers have obviously taken great time and effort into not just making Godzilla look like, well himself for a start, but also both believable and naturalistic as in the viewer being able to see what is in front of their very eyes and believe that the creature could exist, like your eyes do not deceive what you are seeing. But the detail is also in the close up. For several parts of this film, Godzilla is seen to be in the state of minimalistic. So you may not see his entire shape or size for the most part, but even those scenes show a level of detail that is perhaps not as explored. I mean these are giant monsters, obviously and the film takes the standing point of the viewer on the ground, the human element, seeing it through their eyes. So you naturally jolt your head back to look up at them, but because of their size and depending on how far away you are from them, you may not see all of them, but when you are close up the little details are not forgotten, they are included. Godzilla’s hands on the Golden Gate Bridge (anyone else notice that it’s not the first time the same bridge has been attacked by a Giant Monster in less than a year? ), close up details of the MUTO’s when on the ground and really close for comfort, Godzilla’s irradiated damaged flesh, and the detail in the shape, form and material of all three monsters from head to toe. Not only does all of this exist, and in such great detail, but it is also terrifying; and if the special effects achieve such a thing on something that (as far as we know) does not exist, then the effect has been achieved. The monsters themselves have been beautifully crafted, but there is more to a monster than just what meets the eye to which the filmmakers and the audience have an unfair advantage over the people in the film who are too busy running away. The Muto’s are the newest edition of a long line of monsters to tangle with the king, so let’s start with them. The Muto’s are nicely well designed and have essences of real life animals in them presenting themselves as creatures that are definitely of the world and not from space. I do like how there are major differences between the two. The male is smaller and can fly and whose body structure makes him look like a praying mantis on the ground and a bat in the air. Whilst the female is much larger and while exhibiting the same mantis like look, has more in common I would say with a spider as in she is reliant on walking and so perhaps needs to walk as such. They of course share the same features in the face and the look of the MUTO’s is nicely made to make them look sinister. During the night shots this works to their advantage and when the let out the under voice almost clucking, it sounds like a measurement of laughter but it could just be more the sound of the wind passing through their immense bodies. Little things such as the facial features really help to cement their positions as the real villains of the film. this idea also is used to great effect by having them the first monster that truly gets revealed. TO begin with you believe that Godzilla is the one responsible for the attack on the power plant, so far he’s the only creature been mentioned, but by revealing that it was actually the MUTO’s not Godzilla, it adds that emotional connection and presents them as the actual ones to do the damage and as such become the villain and it means that you as an audience member want and need a hero, and it cements Godzilla’s role in the film from the moment he is fully seen for the first time, to the point that he leaves. It is interesting use of both perception and suggestion from the film makers that gives a very big surprise early on and one that hooks you as you wonder, If that is a MUTO, what is Godzilla? 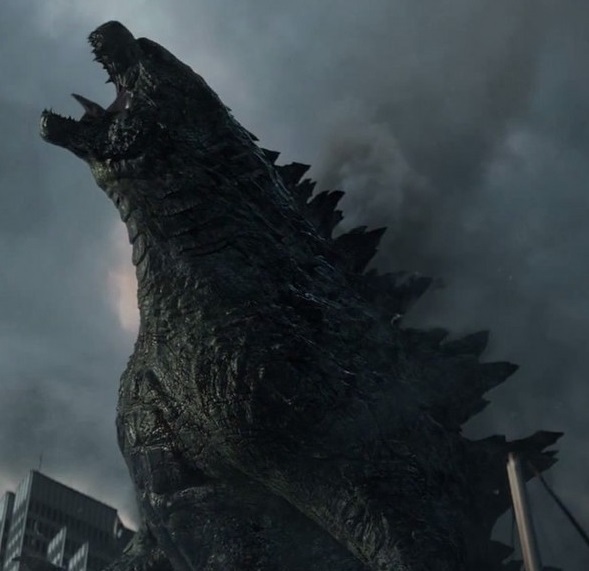 The thing is though, look and sound and abilities are not enough and the thing that makes the monsters in a Godzilla film stand out is personality. 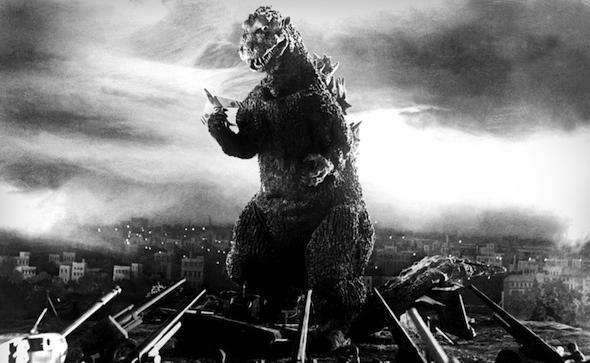 Godzilla as a monster and as a series has survived on several key structures and points but one of those core elements is personality of the monsters themselves. If you look at other past American Monster Movies, they have all been referred to as “it” or “the”, they are all things. But if you give something a name, its presence means a whole lot more. You could just call your family pet (if you have one) “the cat” or “the dog” but you give it a name and refer to it by name and as such it feels more like a friend and part of the family and as such you discover the pet’s personality. The same is true for Monsters. By referring to Godzilla by it or the, it could be any one of a number of things but because of the description, it requires an explanation every time it is talked about. But now that you have labelled him, given him right to a personality, you just need to say the name, and people know who he is. For the MUTO’s it really is more of an it or a thing as MUTO is technically a designation for Massive Unidentified Terrestrial Organism. While the word does sort of become a name as the film goes on, they are still these things and even though they show signs of care towards each other and their young as well as a level of passion, they are just still designated creatures or animal. So while they definitely have a level of passion and character for such well-designed and thought out animals, they are unable to come out of their shell fully due to their possibility for personality restricted, which is a general shame because I really liked them. 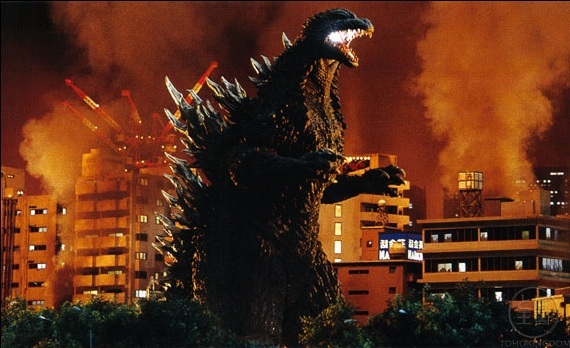 Godzilla on the other hand actually looks like Godzilla (something that did not work out at all 16 years ago). Great care and attention has been taken to make him look like the monster we all know and love, but also to have his own spin so that he is not too much like his Japanese self and so this look can be more independent as well and as such does not need to rely on those films and allows this film to work on its own merits. 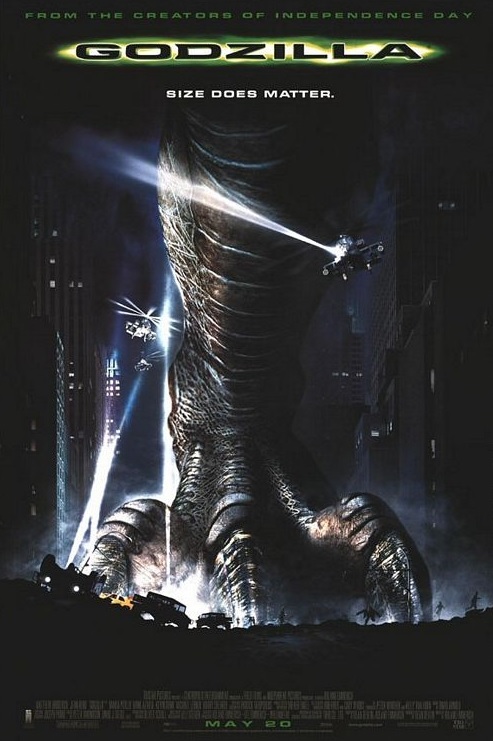 So his size in this film (the biggest to date, and possibly a bit fat) belongs to this film, but attributes such as his scales, dorsal spines, head and tail are like that of the original Japanese monster. One such item is easier to see also now thanks to the film’s point of view and that is of Godzilla’s broken skin which is supposedly caused by the damage done to him by nuclear weapons testing. This goes to show that Godzilla is invincible to man’s most powerful weapons and supports the idea of him being the force of nature and as such unstoppable, but shows a more human element too showing that he still has those scars from long ago battles which on top of that could be emotional ones too but decides to wear them than think about them. His overall look particularly in the facial features when he is first revealed in the Hawaii airport scene makes me think of dragons. You get a brief second or two to look at his face, you get this overall feeling of terror like you are looking at a destroyer, a creature of such great magnitude and ferocity and while his features make him look like a cross between a dog and a lion, the essence of the dragon like nature is there and this helps with the tales of myths and folklore that surround him, and from this he isn’t just a monster, he feels and looks like a dragon too, and this gets your heart racing. But while the look of him is amazing and is true to the Japanese Monster, there are more new editions to the creature but these are more in what he does than what he looks like. But at least one of the things he does isn’t new and has been with him since 1954, any guesses as to what they would be? You got it, his Atomic Deathray. Yes, we were promised a Godzilla true to the Japanese monster and a monster that all we wanted to see but come the final fight I was lost wondering where the Deathray was. Everything was perfect but no sign of that. But then, in the darkness, a shadow grew with a long blue light drawing upwards, I was on the edge of my seat, hoping it was what I thought it was going to be, and then, when his Atomic Breath blasted across the screen, I was so happy, I jumped forward (sort of, more like leaned, not much of that can be done in a cinema seat) and thrust my arms and fists forward and down in a hammer like motion in a gesture of celebration. It was great. It’s not that it’s just there, but the characterization of Godzilla with the power rising up through his scales and then also being the right colour meant that I was so happy and the scene was amazing. I really did enjoy the use of the dorsal spines like shark fins as even after the reveal in Hawaii, it meant that Godzilla still had some screen time but in order to keep something’s under wraps, he could keep that mystery about him but also have that extra element of something huge is coming, and it’s sightings in the water have their own power behind them being seen as you know something big is about to happen. The new roar is really good; it really helps to give this new film its own sense of credit, especially to Godzilla himself. Instead of doing what Emmerich did 16 years ago by taking the classic roar and just extending it, the filmmakers here have created their own unique sound. The sound he produces is still very much like how a Giant creature would, it shakes the ground and produces a lot of noise thanks to the huge inner spaces within its own vocal chords and while it kind of makes me think of perhaps an elephant or other large mammals instead of reptiles (which can’t actually roar)and is overall very well produced to make an absolutely great sound. Godzilla’s personality exists brilliantly in this film but his characterization which adds to this is different in many respects to what he was when he first started but these changes are not a bad thing in any way, shape or form. 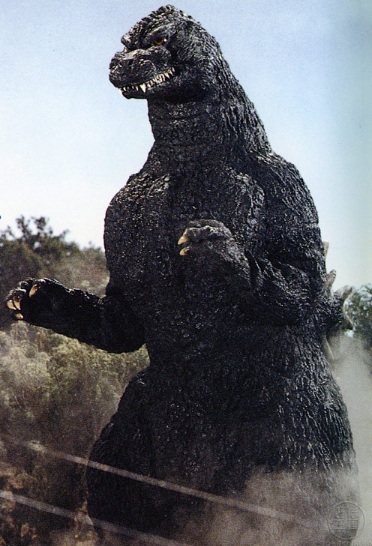 Godzilla is made out to look like a super predator, the alpha male top dog of the natural world. This is presented with the idea that should a creature like the MUTO’s arise, therefore threatening his turf, the predator comes out to play to reassert his dominance over the natural world. This idea may sound a bit corny in that sense, but it is a great way of bringing Godzilla into the story in a way that actually makes sense. This animal like approach helps him to fit more easily in the position of him still being a creature of nature even if he is definitely more than that. This comes even more into the fray come the battle sequences where; when rises out of the water his body movements represent that of something which is more gorilla like. While he fights and acts more like an animal now or at least something that is believable to the natural world, attention has been made to how such a creature could fight if say a giant lizard could stand on two legs, had a big tail, big head (Atomic Deathray) and large arms. But making him like the world is not the same as placing him in it. While it has been stated that his build up to appearance is like that of Jaws with the Dorsal fins in shot and no major reveal for a while, this idea does work splendidly, so while you can see him, you still have no idea what he looks like. Much like the original 1954 film as described by Enthusiast Tony Luke for a BBC Documentary in 1998 said “As the film progresses over the next hour, you just get hints of something big and dark and evil smashing its way through northern japan”. Now while the creature in this film is not like that in characterization, he is like that in the sense that you know something is coming, but even when it is first spotted, you don’t know what it is, and can only see a small portion of it. Another form of characterization and personality was thanks to the opening screen credits. Now while the 1998 film did something partially similar, this time around, it was very clever how they pulled it off. There was still the connotation with the use of Nuclear Weapons, the extra points of A) seeing Godzilla to begin with if only in his submerged form meant that he is at least mentioned from the start along with that great soundtrack, and B) the relation with sea tales of Giant Sea Monsters including sightings of sea serpents and the Kraken which represents his connection to the sea and world but also shows his connection to mother nature herself for always being there when he is needed to be. This use of old folklore tales is very well done and a nice technique by the filmmakers. While the use of him being an alpha predator is well done, in story terms, I feel like I have seen this before, in another monster movie starring another Japanese cultural icon; Gamera. 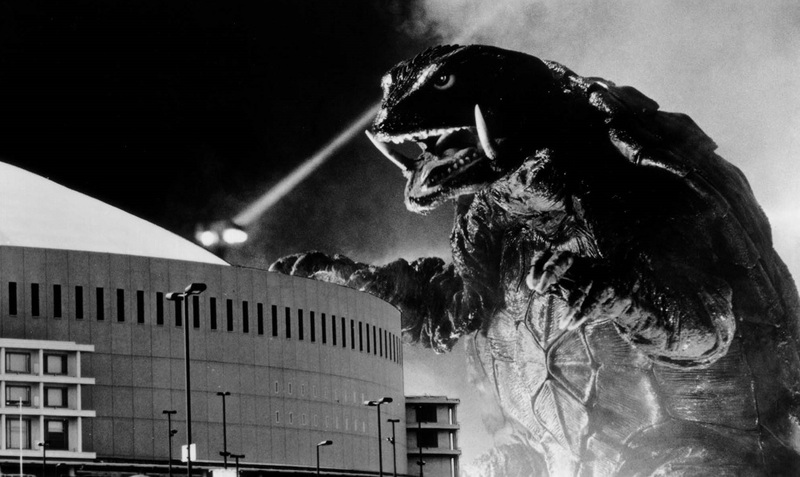 Last year, I reviewed Gamera: Guardian of the Universe. The first in the Gamera Heisei Trilogy. Now for those un-aware, Gamera is another giant movie monster, but taking on the guise of a fire breathing, rocket-propelled flying turtle. Gamera first appeared in Japanese Cinema in 1965 and thanks to a growing popularity which particularly after the Heisei series has gone on to become an icon himself (please refer to my What is Gamera post). In Guardian of the Universe (rephrased to GGOTU) an ancient species of bird comes to life and wreaks havoc in Japan (like all other monsters do) only for them to suddenly have to deal with the appearance of a Giant Turtle. The two then fight with Gamera acting like the superior creature being sent out to take care of the appearance of a new threat. While a brilliant film, I can’t help but feel that the same story structure has been applied to Godzilla. Big creature comes out of the woodwork, bigger creature comes to deal with it, they fight, bigger one wins. 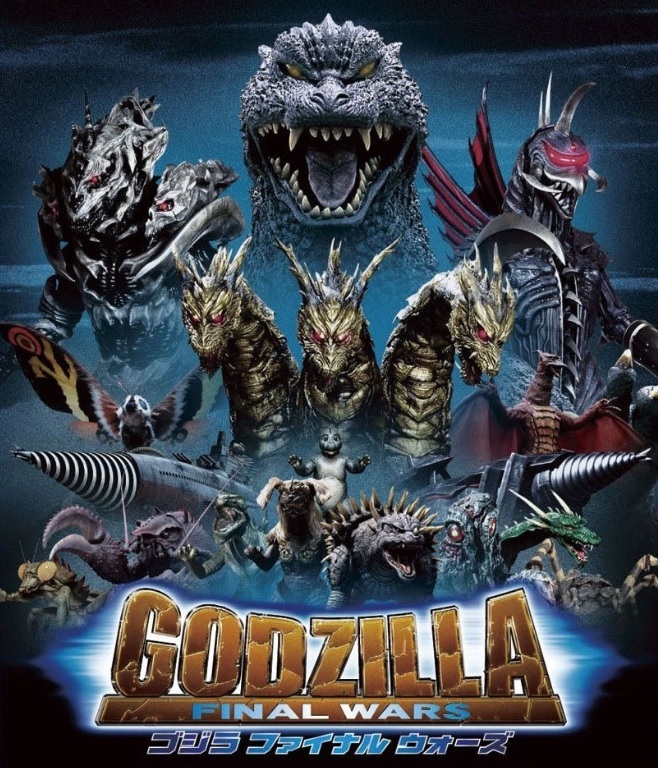 I am not saying this is necessarily a bad thing but I do feel that it is sort of weird that this new film has been almost based on the story from and even the characterization of the lead monster (and even some of the design of the MUTO’s look a bit like Gyaos) comes from the series biggest competition. Mean Gamera himself in that film is an ancient creature created by a lost civilization, much like Godzilla’s ancient history. This is more of something that you may need to make your own minds upon. If you have not seen the Gamera Heisei Trilogy, I do highly recommend it (particularly the last one). But for those who have already seen GGOTU, what do you think? As for the main part of the story itself, there is a lot of talk in it about the want and urge of man to control nature. After going to see this a second time with a friend, she mentioned that it is a lot like Jurassic Park which does use a lot of the same elements. I myself recently read the book by Michael Crichton which shows an urgent need to control nature as well as the refusal to admit when you are wrong and the ignorance of man who just wants to continue. This film uses ideas like that a lot of the time but does show the learning side as come the end, at least for now there is no real want to control Godzilla. But knowing how the American Military is usually portrayed in films, I bet there could be the possibility of them wanting to find some means of control over Godzilla in future films. Also on the nature note there is also the amazement and sense of discovery that occurs when something amazing has been discovered and shows that while we do live on this planet there is still a whole lot more that we don’t know about and perhaps our strive to find it and control it could lead to the end. I do find myself thinking a lot about Blake Snyder’s book; Save the Cat! : The Last Book on Screenwriting You’ll Ever Need, which talks about how films are written to connect with the audience through the use of primal urges, and one of those early settings is described by Snyder as “Monster In The House” to which he further describes by stating that “It’s not about being dumb, it’s about being primal. And everyone understands the simple, primal commandment: Don’t… Get… Eaten!”. This is very much true with this film as the point of view of the audience is that of the people on the ground during the events and the urge to survive the power of the super predators. Much like a Japanese Godzilla film as well, there is a lot of mentions about the use of Nuclear weapons, from the beginning to the end and I particularly enjoyed the scene between Stenz and Serizawa when Serizawa shows him his watch which stopped on the day of the Hiroshima Bomb. It showed a sense of understanding from Stenz about the use of nuclear weapons as well as a possible sign of regret showing that the world has moved on and understand such power more and don’t take things so lightly, but connected with that is the lesson of not being able to control nature too and the understanding that comes with that. And much like how stories in cinema work with the characters having to grow and change, the same is applied here while also showing the growth in the human mind over the last 60 or so years with mentions to Nuclear dominance being one of them. I absolutely love this film from the ground up. It gives a well-deserved new light onto a character whose reputation was dented back in 1998 and corrects everything that the said film did wrong. It respects the design and meaning of a character that has been on-screen for about 60 years now and is beloved by millions of people all around the world. Using a great amount of new expertise in film making including special effects, lighting, shooting and even a soundtrack of extremely high qualities and added to that a film’s cast who each have their own loveable quirks and then Monsters whose design and characterization is of such a high standard, all coming together to make one fantastic film, a film that I have fallen in love with from start to finish. This is the film that I have been waiting to see and while it may have taken somewhere between 4 to potentially 10 years to produce, in the end it was worth waiting for and the confirmation of a sequel just means there is more to look forward to. In part 1 I said that this film is one of the Best films in the series, a comment I stand by, and while it is not my favourite, I do believe that the quality of this film really does make it so. And one other thing on that. A couple of days after seeing this film for the first time, I watched one of the all-time classic best films in the series; Ghidorah, the Three Headed Monster, one of the ones I like a lot, and I did not enjoy it as much as this one. So while its place in the film series and general cinema is still probably going to be debated; if it is able to make a Godzilla fan as big as me happy and not disappointed, it has succeeded. And that is why I love this film, and shouldn’t that be the ultimate goal of films? To Be Enjoyable. Thank You Godzilla.